Richard Barrett is Senior Vice President at the Soufan Group, a New York-based security intelligence firm that provides strategic services to governments and multinational organizations. He is an internationally recognized expert on violent extremism and the measures that can be taken against it. A former British diplomat and intelligence officer with the British government in the Security Service MI5, the Foreign Office, and the Secret Intelligence Service MI6, Mr. Barrett led the United Nations Monitoring Team concerning al Qaida and the Taliban from 2004 to 2013. While at the United Nations, Mr. Barrett helped found the United Nations Counter Terrorism Implementation Task Force (CTITF), a coordinating body that aims to ensure effective counterterrorism cooperation within the U.N. system. In 1992 Mr. Barrett was appointed an Officer of the Order of the British Empire (OBE) by her majesty the Queen and a Companion of the Order of St. Michael and St. George (CMG) in 2013. Mr. Barrett is a board member of the International Centre for Counter-Terrorism in the Hague; theTransnational Crisis Project; the Center on Global Counterterrorism Cooperation in Washington; theCentre for Research and Security Studies in Islamabad, and the Center for the Study of United Nations Systems and the Global Legal Order in New York. He is a fellow of the New America Foundation in Washington, and of the Royal United Services Institute in London, and an adjunct Professor at Case Western Reserve University in Cleveland, Ohio. 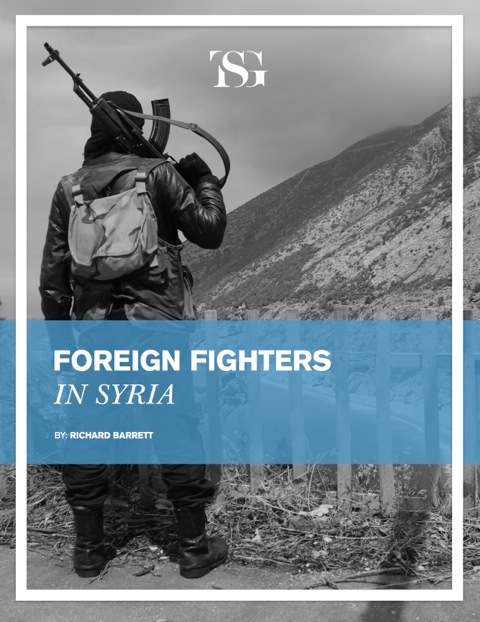 Mr. Barrett sat down with the Reza Akhlaghi to discuss the Soufan Group’s recently released report on foreign fighters from Western countries in Syria and the worsening security situation in Iraq. In your report, you underline some of the key motivations for foreign fighters joining the war in Syria, some of which include “a sense of disaffection, aimlessness, lack of a sense of identity and belonging, and of purpose and meaning .” With nearly 3,000 Muslim fighters in Syria coming from Western countries, how could policymakers in Western societies impact the socio-political and cultural discourse in a way that would disincentivize would-be fighters going to Syria and Iraq? This, of course, is the critical question. At present, policymakers find it hard to respond to the factors that motivate young people to go to Syria to fight and are more concerned about the threat they might pose on return. But until they address these underlying motivators, the problem will persist. Western policymakers could do more to address both the push and pull factors that motivate people to go to Syria. The socio-political and cultural discourse in many Western countries has not yet struck the right note of inclusion and opportunity. Although there is effort by policymakers to influence the discourse in this direction, it has not been successful because it is top down rather than bottom up. The fine phrases are not reflected on the ground and so lose credibility. This is not just a problem for immigrant families, for example, the number of people who go to Syria having converted to Islam is relatively high and for many Muslim-born recruits, their interest in their religion has an intensity that a convert might also feel. I mention this because it is a sign that many people who go to Syria are seeking more meaning to their lives. They are a tiny proportion of all converts to Islam or of the community of deeply religious or observant Muslims, and of course going to fight in Syria is not something the vast majority of Muslims would see as in any way supported by their religion, but this identification with a religion and those that practice it, provides some people with the sense that they belong to a global community, and should do something to support it when it is under attack. Their motivation, therefore, is to do good rather than evil. Policymakers should support moderate influences within their Muslim communities and scrutinize the activity of extremists to see if it is against the law, prosecuting them where appropriate; but in doing so, policymakers have to be careful that they do not play into the “them” against “us” narrative of the extremists. policymakers can also address the pull factors by ensuring that their own policies are clearly expressed. For example, in Syria, Western governments support the opposition to Bashar al-Assad verbally but do not do very much in the way of providing practical assistance. It is hard, therefore, for Western governments to argue ab initio that going to Syria to fight — or to support the humanitarian effort — is wrong. If there were clearer policies and initiatives to provide non-lethal support or humanitarian aid, this might offer alternatives to those tempted to go to fight. Policies have to satisfy the impulses that drive people to volunteer to fight in Syria, not merely condemn their expression. Even more obviously, if the Western states were able to show more determination to stop the war, this too would have an effect, and a very significant effect if they were successful. Policies that set out to punish those who go to fight do not seem to act as deterrents and may make people more likely to delay their return, making them further exposed to radical views. Also, they suggest a judgment of action, which initially may be quite respectable in intent. It condemns the humanitarian along with the extremist. Policymakers should also seek ways to partner with the communities from which foreign fighters come, raising awareness of the possible indicators that someone may be adopting a radical world view and contemplating putting their lives at risk. This should be very much a joint effort rather than a police led activity. Furthermore, by careful and judicious interviews of returnees, the authorities may be able to find ways to amend their policies through careful study of why people went to Syria and what made them come back. To counter the violent ideology of Islamic extremism, what would be some of the scientifically based theoretical mechanisms that should make their way to the policy apparatus in both democratic and authoritarian governments? This is difficult. I do not think that there have been any scientifically conducted studies of counter-measures, and of course, it is near impossible to make an accurate assessment of the impact of policies designed to stop people doing something or thinking in a particular way. Narrative is clearly important, and the radical extremist narrative should be debunked by factual evidence rather than moral posturing. Religious authorities who command respect should take on those who claim religious justification for violence. Credible messengers should be deployed into vulnerable communities to provide positive alternatives to violence and local role models can help as well. Satire has also been effective, particularly in the Middle East. In authoritarian states education, skills training, and economic opportunity can show that the government is not working against the people’s interest. Democratic governments should start from a community based approach, enlisting both the advice and assistance of the community in identifying and addressing the causes of violent extremism. There are policy analysts and critics that see a consistent disunity in foreign policy of key Western governments as having an impact on the rise of ISIS in Syria and its subsequent success in Iraq. Do you see any merit in their criticism? Only to a certain extent. ISIS and other similar groups certainly have no love for the West and most see it as an enemy, but this is because of Western foreign policy regardless of the disunity and inconsistency that may be evident in it. Groups like ISIS would oppose any foreign policy of the West related to the Muslim world; more importantly, people who might have some sympathy with ISIS would also resent Western foreign policy that interfered in the internal affairs of their country or perpetuated the inequalities of the current order. That, in my view, is why it is so difficult to design a policy that is more likely to do good than harm. We have seen over the last 15 years how foreign policy decisions that seem right at the time can have such disastrous unintended consequences. When people in Syria say that the West should have done this or done that, they always assume that things would have come out as planned. History shows that this is almost never the case. One can conclude from your report that there is a need for experts who can analyze important security issues with a holistic and multi-faceted understanding of them. In the day-to-day analyses and reports that we read and watch, what dimensions do you think are overlooked or neglected? One thing that seems to be missing is a deep understanding of the otherness of people. There is perhaps too little attention paid to the cultural, economic and political environment in which decisions are taken in other parts of the world. We all have our theories, but they are often not examined carefully enough against the circumstances that exist elsewhere. People in different parts of the world act and react differently and we should speak to them more to learn why they do what they do. Even where what they do is completely in line with what we expect, the reasons they do it may not be the reasons we think. On the other hand, we shouldn’t overlook the common interests of almost everyone to have security, establish rules which are observed without favor, and opportunity for future development. How influential the Quds force of the Iranian Revolutionary Guards (IRGC) has been in Syria in preventing the Assad regime from falling, and how effective do you think the Quds force will be in Iraq in countering the ISIS onslaught? The main role of the Quds force in Syria seems to have been to improve the capacity of the Syrian Army to meet the particular tactics of the rebels (urban warfare, guerrilla attacks), and to make the Shabiha a more effective and disciplined force. It has also played a major role in directing the assistance to al-Assad from Hezbollah and training Shia militias in Iraq to relieve Hezbollah fighters. In Iraq, it will probably have the same function towards the Iraqi army and in helping plan the tactical response to the territorial gains of the enemy. The al Quds force has become a principal tool through which the Iranian leadership (beyond President Rouhani) can exert its influence. Are there effective measures in place in Western countries that monitor the return of foreign fighters from places like Syria, Iraq, and Libya? The numbers involved present a real challenge. We do not live in a society which can monitor the activities of large numbers of its citizens on a continuous basis, and nor do we want to do so. Certainly, the police and security agencies will be doing their bed, but they will have to prioritize and it will be difficult to do so without knowing much more about what happens in Syria and how returnees might have been affected. The key questions for the authorities to ask are why someone went, what happened to him while there, and why he came back. They can only find the answers by introducing a programme that engages the families and communities from which the fighters come. There are effective measures in place, but it will only take one major attack by returning fighters for the authorities to conclude that they must do much more. This is likely to cause a further erosion of civil liberties which the extremists will be able to exploit in their narrative that the authorities in the West discriminate against Muslims. The report highlights the capability of extremist groups and their effectiveness in the use of social media channels. What policy measures could be developed in the social media sphere that would neutralize violent and extremist messages from the likes of ISIS and Jabhat al-Nusra? Although there are laws in many countries against the portrayal of violence and the incitement to criminal activity, most of the social media use by extremists would fall under the first amendment in the U.S. and protection of speech and freedom of expression laws in other Western countries. It would be wrong to undermine these laws as they are part of who we are. We must always remember what we are fighting for as well as what we are fighting against.